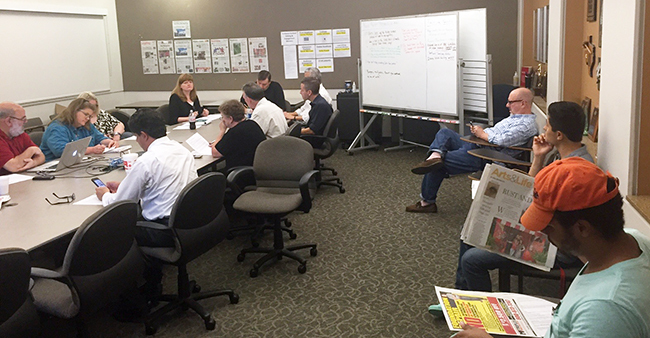 Jordan Greene and Herman Aguilar (far right) sit in on the editors’ meeting at the Dallas Morning News last Thursday. Ten arrested in illegal rehab center. Freud on Fox News. Ex-Dallas Republican mayor speaking against Donald Trump. These were just a few of the stories that caught my eye as I flipped through the Dallas Morning-News newspaper on our way to visit their Dallas offices last Thursday. I wasn’t sure what to expect from this field trip my professor and advisor Dr. Glen Robinson had been so excited to take us on. With my classmate Herman and I being the only two students in the first Reporting III class offered by the communication department, the bar was low. I had been on many other field trips with the comm. department, and thought they were informative and interesting, I felt always felt as if there were something missing. But as soon as we walked through the doors, I knew this trip would be different. As we walked through the double doors, the first person to meet our eyes was a fellow African American. One of my biggest anxieties for the work world is my ethnicity. The journalist who met us at the door was also black, and the more we moved through the building I saw more and more. My perception of who were and were-not journalists was being taken apart. We were given a tour of the facility by Marina Trahan Martinez, a veteran investigative journalist. She took us to the newspaper’s editors meeting, where we got a first-hand look at what goes into preparing and reviewing a newspaper for publication. As I watched and listened, I was transported to a different time in which I was an apprentice watching masters at their craft. But these masters used computer analytics and projections to hone their effectiveness at communicating today’s news, and relied on a state-of-the-art website to communicate that news before it even went onto paper. After their meeting, many of the editors stayed behind to answer our questions. I realized that I was watching more than just some professionals doing their job; I was looking at my future. Until recently, I had been wondering if I had chosen the right major. Journalism isn’t the most lucrative job, and I was wondering if I would actually be able to make it as a career. But seeing these men and women working as hard as they could at something they loved, regardless of pay, made me rethink about how I saw this field that I was going into. Journalism was something I was in for the long haul, and I’ve never been happier or more excited about anything in my life.